Abused and disadvantaged mothers and daughters are being honed into a squad of sharpshooters to save wildlife in the Zambezi valley. Learn more and support the Brave Ones by visiting their site. Kumire is a 32-year-old single mother whose husband ran off with a younger woman while she was pregnant with her second child. She is practising setting up an ambush in the early morning in Zimbabwe’s lower Zambezi Valley, nestling deep into the green undergrowth like a dappled shadow. Primrose Mazliru, 21, stands in the gathering dusk near their camp among the new grass, bright green with the recent rains. Ramrod straight, shoulders back and proud, she smiles despite the vivid scar that runs across her upper lip, where her ex-boyfriend beat her in a drunken rage. “I can testify to the power of this programme to change my life, and now I have the respect of my community, even as a young single mother,” she explains. Mazliru has already bought a small plot of land with her wages as a field ranger. “I don’t need a man in my life to pay my way for me and my child,” she says, a glint in her eye. Like most countries in southern Africa, Zimbabwe uses game management areas around famous national parks such as Victoria Falls or Mana Pools as “buffer zones” to protect the animals. These buffer zones are huge tracts of land much larger than the parks themselves, originally created to benefit the surrounding communities by allowing limited trophy hunting by high-dollar foreign clients such as Walter Palmer, the American dentist who attracted worldwide condemnation after killing Cecil the lion on a hunt in 2015. There are no fences between the hunting areas, or between the wildlife and the estimated 4 million people living on the borders of these protected lands. Some profits from the hunting have gone to support the communities which live in the wilderness areas designated for trophy hunting – almost 20% of Zimbabwe’s land. Damien Mander, the founder of the Akashinga initiative, is a tall, Australian, military-trained sniper, who would look very much at home in the centre of a rugby scrum. Mander was inspired by the story of the Black Mambas, the world’s first female, unarmed anti-poaching unit, who work near South Africa’s Kruger National Park. Having met some of the women on a fundraising trip to New York, where they were giving a talk, he saw the international support and interest they received and thought a similar project in Zimbabwemight be a good way to raise the profile of his own project, the International Anti-Poaching Foundation (IAPF). What transpired went way beyond those modest ambitions. From the very first day of the women’s training, he saw that something very special was happening. He realised that women were the missing link to successful conservation and anti-poaching initiatives. “We have turned a security need into a community programme,” he said. In only five months, according to Mander, this pilot project is already putting more money per month into the local community than trophy hunting did per year. Important people are noticing. 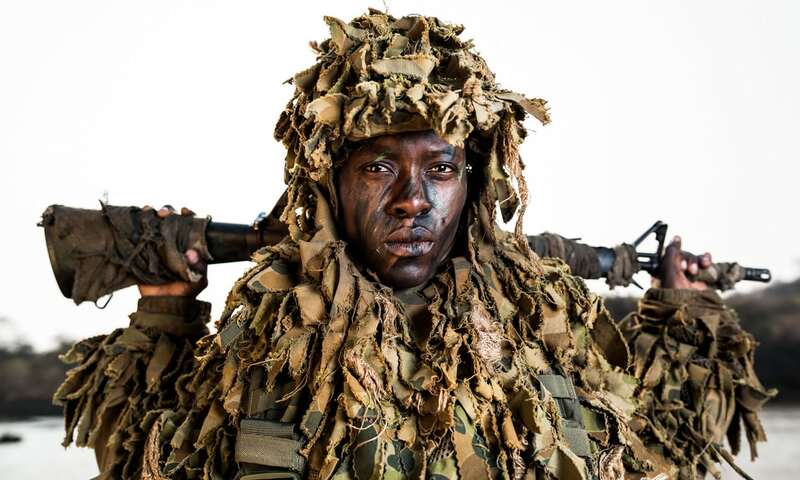 Tariro Mnangagwa is a 32-year-old professional photographer who is visiting and training with the International Anti-Poaching Foundation’s Akashinga field ranger unit. She is also the youngest daughter of Zimbabwe’s new president, Emmerson Mnangagwa. “These women show me hope,” she says. She heads to a beaten-up Land Rover to visit a community in search of a former poacher who wants to talk. Annette Hьbschle, a senior researcher and post-doctoral fellow at the University of Cape Town, believes that the Akashinga model could still be a great solution. While many western governments and conservation organisations take decisions in London, New York and Geneva, the people most affected are usually women in communities adjacent to protected areas in Africa. Community-driven conservation programmes based around empowerment and training for women such as Kumire and Mazliru offer a potential solution to the end of hunting. The Akashinga have embraced it with gusto. “It’s great,” says Kumire with a huge smile, as she stands in the light of the cooking fire steaming with pots of beans and spinach-like greens. “I don’t miss meat at all, when I go home for leave and people try to feed me meat I can’t eat it because my stomach hurts if I do, and I tell people no, don’t give me meat, I am vegan!” The women around her smile and nod in agreement. As the training exercise unfolds, the female rangers are hidden from sight, the muzzles of their AR-15s poking from tufts of grass. Slowly the two scouts designated as “poachers” walk down the animal track. When they get to the right spot the women explode into action, shouting “Get down! Down! Now, now, now!” Within moments they have the suspects handcuffed. When asked why the pretend “poachers” are shaking, Kumire says that suspects always lay “shaking on the ground”, she laughs. Mander ends the exercise, the women help their friends up with smiles, and together they quietly fall into formation and disappear back into the bush. This entry was posted in Editorial, Video Reports. Bookmark the permalink.